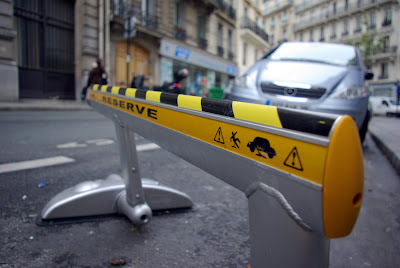 Like many big cities throughout the world - and on top of our rent a bike 'Velib' system - the town hall of Paris has appointed 3 companies (Caisse Commune, Mobizen and Okigo) to offer a car share service. The principle is simple: you first need to subscribe to the service (some companies charge a subscription fee) then whenever you need a car, you just need to pick it up in a parking space near you (like the one I photographed) and pay by the hour (2 to 9 € depending on your plan) or the kilometer. When you're done, you return the car where you took it. The petrol (gas) is included. Pretty clever, especially when you need a car to go to Ikea or to take the kids to the country! Yes a good idea. One that i believe operates in Cheltenham too. I don't know a lot about it though. Have you tried it Eric? Singapore has car sharing too! Oh yeah...the way of the future for city people that really don't need to own a car. We have zipcar and City Car Share here in SF, and yet if you need the car for a whole day or the better part of 24 hours it is still more cost effective to rent a car for the day. Lot's of different car choices here, including hybrids[Prius etc]. Eric, did you see this on David Lebovitz's food blog about the discussion on the article in TIME about French culture?? Scroll to "I don't care" and click on to "saying"...LOL!! Eric said, "The petrol (gas) is included. Pretty clever, especially when you need a car to go to Ikea or to take the kids to the Country!" How true, how true. I love going to Ikea, but getting there is difficult, and getting back with all of the stuff is even harder! I only have one stupid question...Do they have automatic cars for rent too? I hate to admit it, but I never learned how to drive a stick-shift. We have the same in Germany since years and it works well. But I wonder, if it will work in Paris: the way people drive and care about her car in Paris is really different to e.g. Germany. Simple thought, but, if the car crashs, people don't seem to be bothered too much – at least when it is still working and it is their own car..
Come to Cheltenham Michael, i shall teach you with pleasure he he. > Lynn. No, I haven't yet - I have my scooter, you know... - But to tell you the truth I just subscribed (well pre-subscribed) to one of them and, well, I'm waiting to test the service. > Keropok. I would imagine that a country like Singapore would be the first(!) to go for that kind of service. Actually here, I don't think they have hybrids nor - even better - electric cars but energy effective cars. > Tonton. I noticed this last June, when I was in SF and I thought to myself "how come we don't have this in Paris?" and bam, we do!! I'm going to check on David's blog right away. It's been a while since I've seen him and it's a shame because he's a cool guy - on top of running a nice blog! > Michael. Actually, it's interesting you mention Ikea because - to my knowledge - they were the 1st to rent cars by the hour. Eric, I'm not sure if you noticed, but one of the companies you cited, Mobizen, has a link to your blog there. They can't be too bad if they know a good Paris blog when they see it. If I ever try this service out (after stick-shift lessons from Lynn), I'll be sure to give Mobizen the first chance! In Austin, Texas we have this service now downtown. We plan to move into a downtown high rise with two cars but as time goes on and our life gets simpler (i.e. we aren't running errands for the elderly) I could see eliminating one and grabbing the share car when needed. We are such an auto-centric city, I'm not proud to say. J'aime votre photos!!! Great shots! I live in Chicago, IL, USA. In August of 2006 the transmission in my dear olde Volvo died. It only would work in first. I got rid of it and now use a rental service similar to the car in Eric's photo. Here in Chicago it is named IGO. Another versions are Flexcar & Zipcar. I believe the concept originated in Seattle, WA. It works like follows. You pay a small entry fee and get a smart card that you carry in your wallet. You have a member and an ID number. The card remembers that data. Two to three cars are parked in parking areas all over Chicago within about 4 to 6 blocks of each other. I only have to walk two blocks to a super market parking lot which is on Chicago's north side in the Edgewater neighborhood which is also near Andersonville. It is less than a half block from a metro stop. Many people who live in these areas along the lake front do not own cars. IGO cars are environmentally friendly. They get good milage and are reasonably small, but there also are a few vans including the Honda Element for those trips to IKEA that keeps a number of parking slots reserved for IGO cars near the entrance. The fee to use the car is usually $6.50 per hour plus .50 per mile. Fuel and insurance is included! I usually rent a compact car for between 2 and 4 hours. It works fine for us, but it does put a crimp in spontanity. It also makes you jam a bunch of tasks together and the stress and pressure of accomplishing them within the reserved time usually is unpleasant. You have to return the car on time because someone else may have it reserved, although you can get it extended if you call the rental office. You are punished if you return the car late. One I had the Element reserved and the previous person was over a half hour late. Not good! I don't miss the car since I bike everywhere including downtown to the loop. I also walk a lot with a back pack and tote bags. We also use a shopping cart since we live so close to the market. uchioqemczpigakzlumq, http://nailfunguscurecuretreatment.com nail Fungus cure, tqVLKdz!